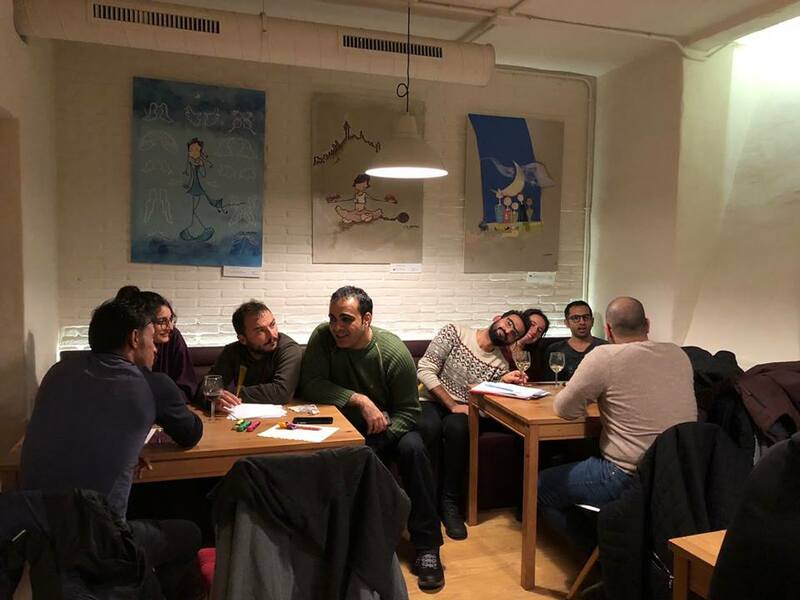 Nestling into a cosy corner of the bistro La Ciudad Invisible, Madrid, last Monday evening, I had the honour of participating in a Madrid for Refugees’ Arabic-Spanish Intercambio; a spellbinding occasion that inspired more than mere language fluency, but an entire culture sharing experience. The linguist Vivian Cook once stated that given the appropriate environment, two languages are as natural as two lungs. The MFR intercambios more than live up to this claim and in many ways breathe fresh new life into it. 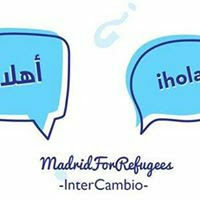 The Arabic-Spanish Intercambios are an initiative designed to promote language learning and social integration within the Spanish and Arabic speaking communities of Madrid. They are a platform not simply for exchanging languages but also exploring wholly new cultures and bridging international gaps. 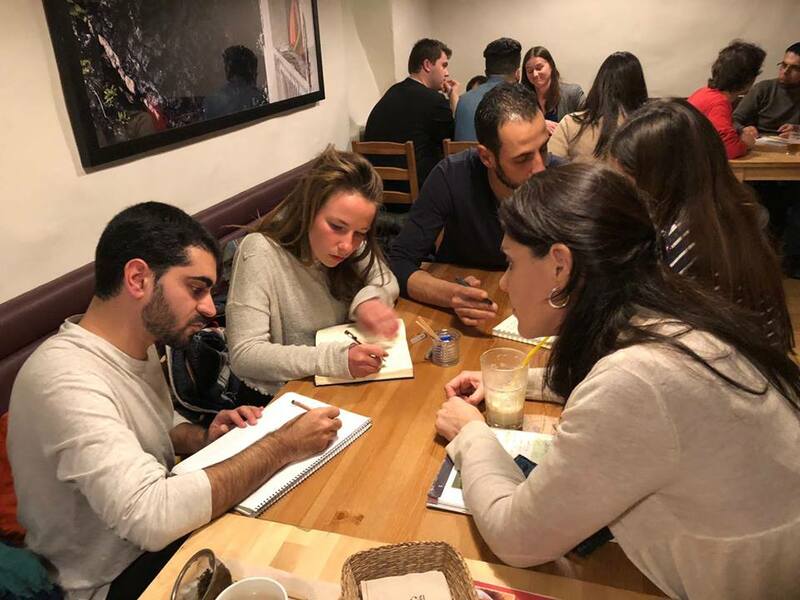 Since February 2017 people from all over the world with a common interest in Arabic culture and language have ventured into the basement of La Ciudad Invisible to participate in a beautiful and collaborative learning experience. Initially held as a bi-weekly event, it was unsurprisingly shifted to weekly after popular demand, and now takes place every Monday from 20.30 to 22.30. This evening’s attendance reflected that popularity, with barely an empty seat in the house. As the tune of multiple languages invaded the room one thing immediately became apparent, that the key component of this event’s wonderful character is how, in the words of its current organiser Paola Ponce, it creates an “open and safe space” for conversation. The abundantly friendly atmosphere encourages a sense of community among those present, and equally nurtures interest in and respect for each other’s language and culture. “It is a beautiful moment when two worlds come together and differences are somehow both unimportant and important at the same time,” as Spanish first timer José explained. An innovative approach like this naturally attracts a special type of open-minded and enthusiastic individual, and all play a central role in the success of this event. Those in attendance represented a kaleidoscope of backgrounds. Culturally, there were people from across the Arab speaking world including Syria, Morocco and Palestine, as well as people from Venezuela, the U.K, France, and of course Spain. Similarly, a range of levels were catered for, from the absolute beginner to the more experienced polyglot. There were even some linguistic celebrities present, such as one woman who spoke eight different languages; with this in mind it is easy to understand one attendee’s belief that it was “like learning from Einstein.” But most importantly, everyone present wholeheartedly entered into the spirit of the event and embraced the “social learning” approach. 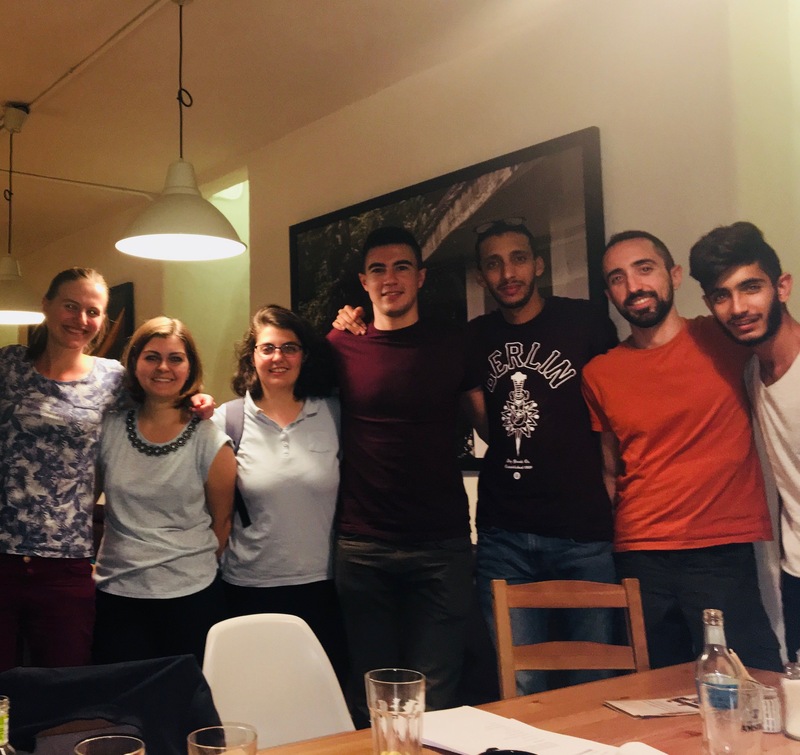 In the words of Anas from Syria, everyone understood that “you are here to help people, and people are here to help you.” Awkward social barriers were effortlessly dismantled leaving behind a room simply filled with friends sharing language, culture, and conversation. Beyond this, Paola explained that the event is also an “opportunity to contribute to a community”, and it thus provides a space to share resources and opportunities. This was reflected in the vast range of motivations for attending. There were some who came purely for the experience, like a Moroccan regular who described how it was “a pleasure to teach something important to me and see others genuinely interested in it”. Others were there to support their studies, while one Spaniard was in preparation for a refugee camp project in Jordan and wanted to learn some vital vocabulary. In the past, the event has even been used to share and support those involved with wider NGO events, as well as finding job opportunities, accommodation, and wider assistance with life in Madrid. It would be a crime to forget the indispensable La Ciudad Invisible whose owner is a huge advocate of social causes, particularly refugees. The intercambios have been held here for over a year now and they continue to vigorously support and actively contribute to the events and to MFR more widely. These evenings would be nothing without this establishment. Such a vibrant event will certainly have a bright future, and already talk in various languages is considering how it can further flourish. For instance, Paola hopes, alongside increased numbers and frequency, to organise cultural events related to effective language learning techniques, such as the use of music or dance. Whatever the future holds, with Paola and her team of volunteers at the helm, and a continued attendance of such rounded and passionate individuals it surely won’t be lacking any of the heart and soul that makes this event so unique. Until next time, hasta la próxima, إلى اللِقاء.